Check Out These 10 Art Deco Rings If You Want Super Unique Jewelry! Do you consider yourself an outside-of-the-box kind of person? We all know that there are people out there who like to go by the book and make sure not to take risks as much as possible. Which let’s be real, that’s totally fine. Safety first, right? Even if you are an outside-of-the-box kind of person, there are probably aspects of your life that you would prefer to stay right in line and not veer from the standard path. But if you are the type of person that constantly has the creative juices flowing, some things in your life may seem a little bit boring. Does that ring a bell for you? Whether you are a major advocate of not following the crowd or you just like to add some flavor to your life, you may find yourself looking for clothes and jewelry that are a bit different from the norm. If that is you, we’ve got something very exciting up our sleeves that we think you will absolutely love! Let us enlighten your life by introducing the art deco ring. You may have heard of it before, but some of you may have no idea what I am talking about. If that’s the case, no shame! But, you’re welcome. These rings are incredibly beautiful and just a whole lot of fun! They are sure to stand out of the crowd just like you want them too. We are guessing that there won’t be any conversations at girl’s night or work gatherings about you and so-and-so having very similar rings. In fact, there’s a good chance that nobody you know will have a ring that is just like yours. But more than that, it is sure to be everything that you personally want it to be. These art deco rings are gorgeous, vibrant, and eye-catching. They add so much personality and charisma to your standard diamond ring or even engagement and weddings rings. Now that we’ve got you excited, which you truly should be, you may be wanting the details about art deco rings. What exactly are they? What makes them different from other beautiful rings that we see regularly? Well, there are definitely some similarities and then there are some differences. First of all, the art deco rings were a huge hit back in the 1920’s and 1930’s. This may seem obvious to some of you, but others may not understand why. The 1920’s were concerned the era of the Art Deco movement in architecture as well as in decorative arts. This movement was established in the 20’s, but really took off and developed in western Europe and the USA in the 1930’s. This era was all about the creation of art and design. 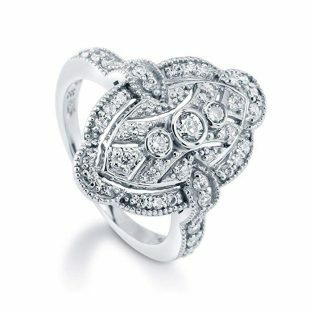 Likewise, the art deco ring boomed during this era and lucky for us this style is totally trending now. The main differences between your standard engagement or wedding ring and a specific art deco style ring are that it is designed with geometric patterns and even abstract designs. You can count on these gorgeous rings being full of diamonds or other gemstones and they often include contrasting colors as well. When you put all of that together in unique and intricate combinations, there is a good chance that you will quickly fall in love with the options out there for this style of rings. Furthermore, don’t shy away from all of that if you are more of simple jewelry type of person. This style of rings ranges from the flashiest and largest designs to dainty and simple pieces. There are truly options out there for anyone and everyone who is attracted to these stunning art deco rings! So let’s take a look at some fantastic options for you! They range in sizes from dainty bands to dazzling knuckle rings. You will also see a wide variety of prices depending on what the ring is made of and what type of gemstones are used. Whether you’re looking for something luxurious or a budget-friendly ring, we’re sure that you’ll find one you love. Let’s take a look. First up we have this fantastic and dazzling art deco ring. It is made of rhodium plated sterling silver. True sterling silver is nickel free and hypo-allergenic, making this a great choice for almost anyone to wear. The band of the ring is 2 millimeters wide. The main stone is a 0.11 carat round cut cubic zirconia that is 3 millimeters. This is a premium quality stone that shines beautifully on its own, but obviously, there is so much more going on with the design of this gorgeous pieces. The art deco ring holds true to its characteristics with an abundance of geometric patterns and its abstract design. The entire piece is a unique oval shape, slightly pointy in some areas and rounded in others. The oval expands nearly to the knuckle when wearing it. It is the perfect size to catch eyes, but not too heavy or overwhelming. The center has 3 circle stones surrounded by a smooth thick border. The center one is the largest, the one measuring 0.11 carats, while the other two are just a little bit smaller. The 3 stones are lined vertically and flow perfectly with the large oval shape. There are so many details, it is absolutely breathtaking! You will be enthralled by the symmetrical lines of separation throughout the ring, the modest cubic zirconia gems that add detail all over the ring and band, as well as the small silver balls that contrast perfectly with all of the shine! Even the band is exciting, the way that it gives the look of overlapping up over the center stone display, with its triangle pointed ends is just flawless. It is such a beautiful and unique design. This piece is fair priced for such great quality. 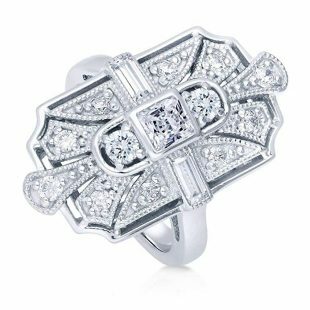 If you are looking for a piece that is booming with vintage vibes and extraordinary shine, this is the art deco ring for you! This next art deco ring is absolutely stunning. We may end up saying that about all ten of these pieces on this list, but seriously they all are just that! This ring features a large center gemstone that is obviously the center of attention, literally. 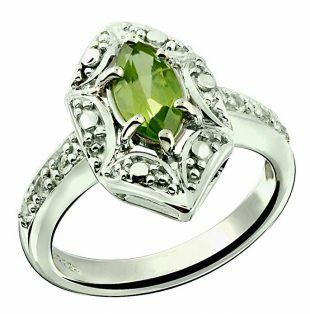 It is a large 8 millimeter by 4-millimeter peridot gemstone. If you are unsure what peridot is, don’t fret. It is a green semi-precious mineral. The green is different shades of olive and is so beautiful featured like this as the large focal point of the ring. If you aren’t much of a green person, or maybe you love it so much that you are dying to have it in more colors, then you will be pleased to know that it also comes in two more colors. It is available in citrine, which is a glassy yellow colored variety of quartz. It also comes in garnet which is a precious stone that is a deep red color. Each of the three colors is fantastic and you will not be disappointed in any choice you make here, especially snagging all three! If you really do want all three but are worried about the price, there is no need to stress! You will be surprised at how inexpensive this ring is while still being and looking like a high-quality piece! The gemstone is definitely the main feature, but as with any art deco ring, you will see detail all around it. It has round white topaz surrounding it as well as other small gems and details. The ring is sterling silver and rhodium-plated so that it will hold up well to daily wear and tear and not tarnish easily. If you have any issues with your piece or wearing it, simply clean it to return it back to its fancy mirror-like finish. It is just the right size to wear any day and all day. The colored gemstone is the perfect way to add a pop of color to your life and your wardrobe each day. It is available in sizes 5 to 12 and has most sizes in stock in most color options. This is such a beauty and we are sure that you’ll love it! 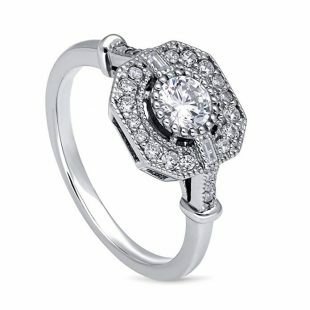 Are you looking for the perfect, unique engagement piece in this fancy art deco style? This is a fantastic option if that is what you are in the market for. Let’s talk about that incredible design for a minute, shall we? Its mainstone is a 3.01-carat Asscher cut clear cub zirconia. The illusion this halo style gem gives is mesmerizing and fascinating! The halo effect is highlighted with two unique jewels in each corner and circle stones all around the large stone. The transition to the band is detailed with rectangular stones and small circular ones as well. It is so special and beautifully designed. It’s made of great quality, plated and polished sterling silver. It comes in sizes 4 through 10 with all of the half sizes in-between. It’s a beautiful art deco halo style ring at a very reasonable price! If you are tying the knot anytime soon or want to upgrade or switch up the ring you wear now, this is the one for you! Are you looking for a true 1920’s styled ring? Do you want something that reminds you and anyone else who sees it, of a fancy flapper girl from that beloved decade? 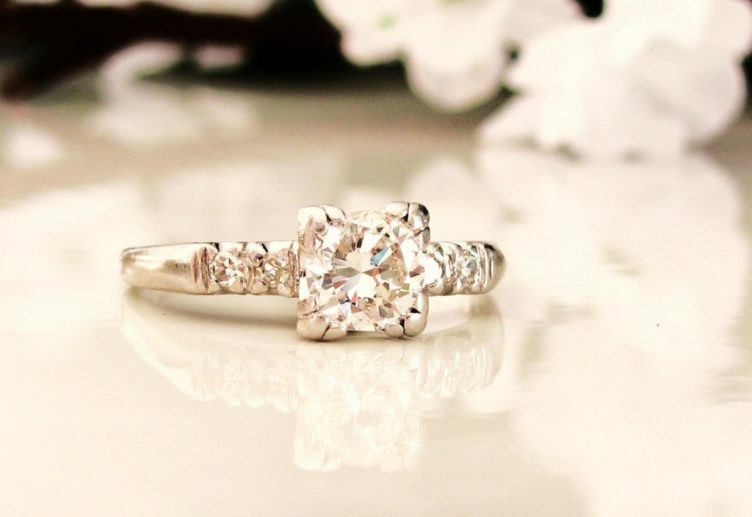 If so, this ring is calling your name. This piece will transform you back to that art deco era rapidly as you slide it on to your finger. It is the perfect piece for a flapper girl costume, a fancy night out on the town, or a vintage-inspired party! This is sure to stand out of the crowd just like you are looking for! It is a full finger ring, meaning it will take up a good portion of your lower finger and up onto your knuckle. Yes, it’s that stand out and turn heads kind of piece! It is 1.5 inches wide and the band is 2 millimeters. It weighs 12.5 grams and is made of a base metal with rhodium plating that will help it last over time. All that bling and shimmer comes from an abundance of cubic zirconia gemstones, that make it easy on the eye and on your wallet. It is fair priced for such a flashy piece. You are going to love it, especially once you are wearing it! It has all of the features of art deco that attract us. The center circle cubic zirconia gem is eye-catching from the get-go. Then the intricate lines and smaller gems that are pieced together to form such a fantastic design are just mesmerizing! The lines of symmetry are flattering and can be seen from all aspects of the piece, whether you are looking from side to side or top to bottom. The detailing and the design of this ring are amazing and it is sure to make your hand and your eyes glow each time you wear it! It’s the kind of jewelry that you will be giddy about each time you put it on your finger and are reminded of each little detail that you fell in love with the first time you saw it! Can we pick a favorite?? If so, this might just be the one. If not, that’s okay because we have thought that same thing each time we look at a new art deco ring. You may just be in that same position as you see each of these gorgeous pieces. This one is totally and completely swoon-worthy, don’t you think? It is full of fantastic characteristics and it comes together incredibly well. We are smitten by its unique raised gallery design! The center of the ring is a shiny 1 carat round white sapphire. It is cut so perfectly and created to give just the right amount of shine. That sapphire is surrounded by dainty sterling silver jewels. 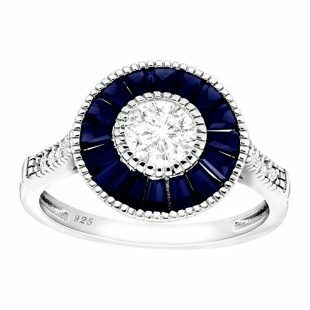 The obvious eye-catcher on this ring is that sapphire blue color for us! It’s certainly not the kind of vibrant color that you see in the majority of engagement or wedding bands, but after seeing this ring it’s hard to understand why it’s not. The blue is incredibly beautiful and it’s deep shades make it perfect for an everyday piece. The blue sapphires are ¾ carat baguette-cuz gemstones that surround the gorgeous center white sapphire. This design makes it easy for each individual layer of the ring to pop out, while still all pieces flowing together. The outside is enclosed with more of the sterling silver jewels that complete the transitions of the whole piece. As if that’s all, of course, the band is enlightened with intricate detailing that also catches your eye with its beauty. This ring comes in sizes 7, 8, and 9. It is truly stunning and a perfect creation in the art deco style! If you love the art deco style but aren’t necessarily crazy about the color, this is a great option for you! We all have that friend who has a wardrobe full of white, black, gray, and brown no matter what season it is (cough, cough, yup we know you are out there). But hey, that’s not a bad thing! Some of us prefer a wardrobe that is safe during all seasons and that can be mixed and matched with endless options because it all goes together for the most part. You may find that you are that way with jewelry instead, or maybe you are that way with both your wardrobe and your jewelry collection! No shame girl! There is nothing wrong with that. If you have been loving these rings we have shown you so far, but when it comes down to it you know that you just wouldn’t wear it that often because it’s too bright or bold, that doesn’t mean that the art deco ring style is out of the question for you! Phew, that’s a relief, right? Because the design on these pieces is amazing and we wouldn’t want you to miss out, even if you prefer a simpler piece of jewelry. This ring is one that may seem like a popular type of engagement or wedding ring at first glance, but once you get your eyes locked on the details of it you will see just how different and unique it is. It is a very special piece. The metal is sterling silver, rhodium plated, and even has a high polished finish that will ensure this beauty stays shiny for you. The band is 1.9 millimeters wide. The overall shape of the center is a large octagon which is unique in and of itself. But that’s certainly not all. In fact, we are just getting started. The main stone in the center of the octagon is a 0.36 carat round cut clear cubic zirconia that measures 4.5 millimeters. See, as we said, it is shiny and beautiful but not overwhelming or gaudy in the slightest. That center stone is lined with silver jewels and then there is a fantastic amount of detail throughout the rest of the octagon. You will see a couple of rectangles, a plethora of circles, and even more. There is different sizing, different textures, and different amounts of shine all throughout the piece and even into the band. 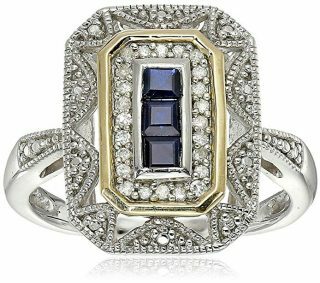 This gorgeous vintage inspired ring is sure to give you all the art deco you please while just being the right amount of glamorous for your taste! Do you have someone in your life that is just fabulously pink? We all have that friend who loves it, breathes it, wears it, and flaunts it any way she can! This is a ring she would fully support you getting your hands on, or getting on your hand we suppose! This is such a unique piece and is everything we dream of when we picture an art deco ring. The ring is a mix of sterling silver and 14k yellow gold. It features a created ruby in the center and is fully surrounded by an exquisite amount of shapes, sizes, and textures of jewels. The only downside of this ring, we just have to be upfront with you so you won’t be disappointed later, is that it is only available in size 7. So if that is your ring size, consider yourself one lucky woman. For those of you who are feeling a bit disappointed, there may be the option of getting it resized if it is a ring that you just can’t stop dreaming about. We totally get it if that is what you are feeling! This silver piece with the gold accents gives the perfect two-tone vibe that is totally trending right now. The details of the ring include silver balls, arches, and other gemstones and shapes. The rectangular ruby immediately draws you in. Then you have the gold rectangle that is spaced just a bit away from the ruby and outlines the whole of it. Throughout each section of the ring and even into the band you will see details on details that are captivating and rich! This is such a gorgeous piece and though it may seem a little bit pricier than some of the others we have shown you, we can assure you that it is quality and the metal is true to its description. 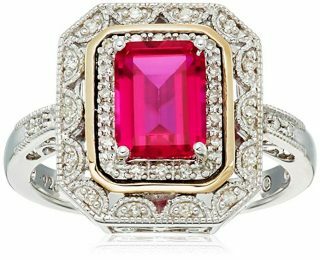 If you are a pink lover, this is the ring for you! Next, on our list of jewelry pieces that are sure to stand out of the crowd, we have this gorgeous large ring. The ring is made of high polished stamped sterling silver. It is rhodium plated and nickel free. It’s the perfect cocktail ring, great to wear for any fancy occasion you have in your exciting life, and it is absolutely durable enough if you are wanting to rock this bling every day. The main stone is a 0.39-carat princess cut clear cubic zirconia. It measures 4 millimeters. This art deco piece has a beautiful design and is created with artistic detail in mind. We love all of the different shapes and textures involved in this art deco ring. 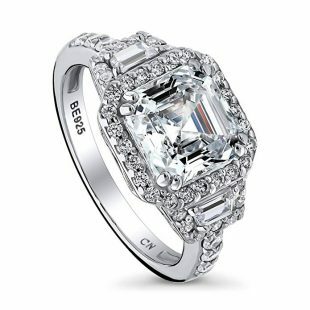 The center stone is a princess cut and is favored on either side vertically by beautiful round cubic zirconia gems. All throughout the ring, you will find circle jewels and shiny gemstones. We’re obsessed with the rectangular gemstones that lead from the center cubic zirconia gemstone to the band horizontally. It is such a stunning piece and just the overall shape of the ring is sure to give you and anyone who sees it all the heart eyes! This ring is priced fair, is high-quality, and is beautiful! This is a shiny one that you do not want to miss out on. 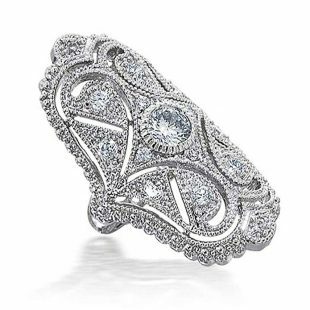 We love this version of the art deco ring. It isn’t the big and extravagant ring you are used to seeing in this style, but it is definitely still part of the art deco family. Do you remember when we told you that there are options out there for those of you who don’t want very much bling or are hoping for something more simple and low-key, yet still intricate and in line with what we see in an art deco ring? This is one that is sure to be right up your alley if you were looking forward to that. This gorgeous piece is made of stamped 925 true sterling silver. The band is 3 millimeters wide and very flattering on any hand. The main stone is 0.9 carat with a baguette cut. It is a simulated emerald cubic zirconia. We are drooling over this gorgeous green color and the contrast with the white jewels and silver metal. It holds true to that of the art deco style with its geometric patterns. 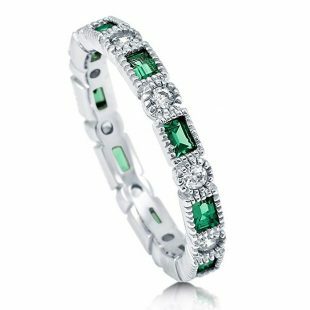 Here we see a perfect alternation of clear cub zirconia circles and baguette cut emeralds, each lined with sterling silver jewels. This is such a beautiful ring and would make a great anniversary gift or staple piece for your everyday wear! Trust us when we say we could go on and on for days about this gorgeous style of rings. Have you completely fallen in love with the art deco rings too? This last one is somewhat similar to one that we have seen before, the pink one if you recall. But it is so beautifully unique still that we had to include it on the list too. This ring has a triple gemstone center of 3 sapphire vertical stones. The trio of stones is surrounded by a 14-carat yellow gold halo and is filled with various sizes of circular jewels. The outside of the yellow gold halo is one feature of this ring that we are completely smitten by. It almost has a sun-like design around the rectangle made of sterling silver metal. It is also dazzled with small circular gemstones. The entire ring is absolutely beautiful! It comes at a fair price for its fabulous design and high-quality metal. This is an art deco ring that will leave people’s jaws on the floor when they see you wearing it! Yes, we’ve made it through the ten art deco rings for you to check out already. We understand if it’s hard to believe, but time flies when you’re having fun. This style is trending right now and the possibilities are endless with these gorgeous designs! We hope you found one that you absolutely love because this is a sure piece to stand out of the crowd!